Hempnall Butchers is a business owned and run by Steph and Martin. We established the business in October 2006. Our shop is at the heart of the thriving South Norfolk village of Hempnall, 9 miles south of Norwich. We stock a wide range of excellent quality fresh locally sourced meats, fruit and vegetables. Our deli counter consists of cooked meats, pasties, pork pies, sausage rolls, cheeses, and olives. We also stock larder essentials and a wide range of locally produced products such as sauces and cakes. We also offer a free delivery service within 15 miles and minimum orders to the value of £15.00. 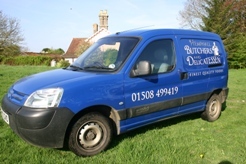 We can deliver to your home or business anytime Monday to Friday between 0900 and 1700. Copyright © 2011-2019 hempnall-butchers.co.uk. Hempnall Butchers.